Time catches up with all of us eventually, even world-famous ice discs. 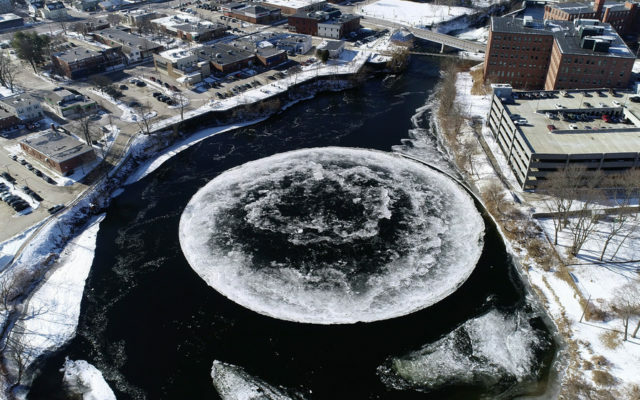 This week’s unseasonably warm temperatures have taken their toll on the Presumpscot ice disc in Westbrook. Images taken Wednesday show the ice disc has lost its circular shape and appears to have again become stuck. “With the warm temperatures melting away the ice, the ice disk was on the move today. It rotated a bit and then got hung up again. … The ice disk’s time may be limited with unseasonably warm temperatures upon us,” read a Wednesday post on the city of Westbrook’s Facebook page. Portland saw a high temperature of 62 degrees on Tuesday, breaking its previous record for Feb. 5 of 51 degrees, set in 2005, according to the National Weather Service office in Gray. The 300-foot ice disc caught attention on Jan. 14 and quickly became a national and international sensation, drawing onlookers from near and far to Westbrook. Not all that attention was welcome, though. On Jan. 17, Westbrook police stopped a man from venturing out onto the ice disc. And then on Jan. 24, a New Jersey man tried to carve a giant peace sign into the disc. Brown University scientists even set up a webcam to observe the ice disc. Researcher Chris Horvat told the BDN last month that the frozen circle may provide clues on how Arctic ice moves and evolves. That webcam will continue to operate into the spring, according to the Portland Press Herald.